A few weeks ago I was watching at first time the finnish baseball game here in Joensuu. Or not. I came into the thoughts that this has happened even before and it was maybe year of 2000!! I was participating the summer sportcamp for the kids, and in the end of camp we were cheering for the local baseball players on the field. 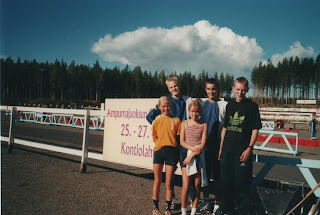 At that time it was really hard to pick up only one sportart for the camp as I wanted to choose dancing, floorball, swimming, skiing and all the possibilities:D Anyways I took biathlon. Just for the reason that my big brother did and I was sleeping in the same tent with him. He had just started some biathlon training with the same coach who would be coaching at the ”trainingcamp” so it was an easy choice. :) I kind of fell in love in shooting with eko-rifles and the difficult combination of two different sportarts. Though, both were already familiar to me… somehow. Back to the current moment it’s been a smoothy spring. First I was visiting the lovely city of Köln (Cologne). Strongmanrun in Nürburgring was just awesome even if it was cold and rainy day, but the spirit was impressive! And just to mention I beat our boys;) haha. They were complaining that my female figure made it easier to pass the track quicker… people got jammed before the barrels it was an hour before the boys got over the first barrel!!! On this Sunday I will travel to Otepää, Estonia once again. 8th or 9th year in a row will be now. The sportclub team gets smaller all the time and this year I don’t have any of my age there as Sarianna will not be there anymore… Next year may be different then. After two weeks in Estonia I’ll be at home and then in the end of August we head to Germany again where a friend of ours will have wedding in Hamburg. In case we take our car there I’ll be traveling with my boyfriend Sampsa down to Austria and train with the finnish A-team from 3rd to 13th od September! Enjoy the summer. See ya!